I totally need to update this blog. I'll probably document my next TR exterior or interior claim as I make it, lots of pictures, stay tuned! As part of an exteriors showcase for TR, I decided to make a small (6 cells plus seafloor) island using the pieces and textures from Bloodmoon. Should I get promoted for this island, I will most likely celebrate by turning it into a full-blown mod, with interiors for the village, NPCs, creatures, and a few dungeons (two caves and a barrow). For the moment at least, here's something completely different. As my latest claim at TR, I've decided to take it upon myself to build the Guild of Mages for the Hlaalu capital of Narsis, which is, as you may have guessed, quite a large undertaking. In my attempts to make the place as awesome as possible, I thought I would have a go at doing a bit of thinking out of the box modding. I decided to have a go at building a botanical garden from which the mages could collect alchemical ingredients for their work. Some pictures of my work-in-progress project. More images to be added as work on it continues. All images taken from the CS (and the print screen key) until I've finished and can do a proper in-game playthrough. In a strange flash of inspiration late one night, I decided to start creating my own mod, independant from TR. 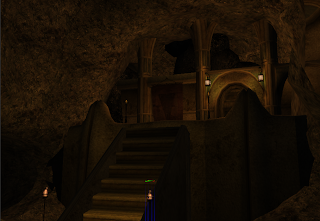 After playing the questline for Great House Redoran and building their stronghold, I felt it was a little bit uninteresting and insubstantial for such an ancient political faction. Messing around with the redoran and pycave pieces, I think the results are quite interesting, so I plan on building a largeish stronghold for the player in the ashlands. 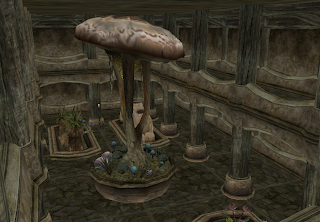 Once the actual exterior/interior/NPC modding is complete, I'll probably release it to the public on PES or TESNexus, and then if I'm feeling really daring, I will have a go at making it constructed in stages via quests, as is the case with the Great House faction strongholds.